Choosing the right exterior paint for your garden can be complicated, as there are a range of surfaces requiring different finishes, including render, woodwork, metal, brick and stucco. On many older homes, you will find a combination of these materials. Fortunately, there is an exterior paint for every type of surface, and most paints are suitable for more than one application. 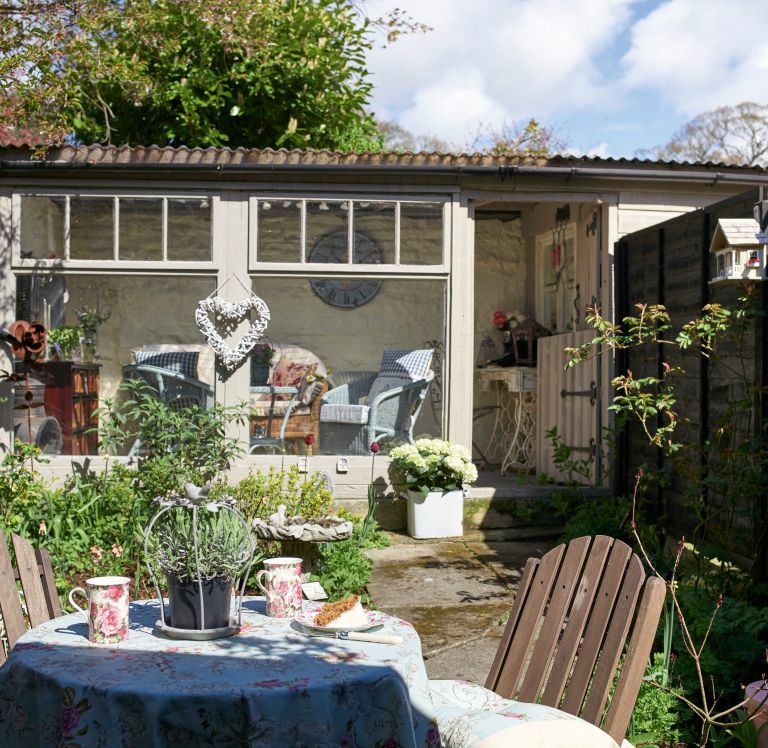 Make your outdoor area as visually inspiring and colourful as indoors by treating furniture and garden buildings with these exterior paints and varnishes. Using paint in the garden as part of a bigger garden project? Find out how to plan, design and cost your garden tranformation. Then head to our dedicated DIY pages for more practical DIY tips. Create interest with paint when the garden is bare: use garden and outdoor surfaces as an additional way to add colour to the garden. Stick to a colour theme for the best effect. Then use plants as highlights to lift the effect and introduce contrast. Spend time on preparation or you will end up redoing your efforts sooner than you think. Before you start painting or treating any surface make sure it is clean and properly prepared. Don’t leave damaged paintwork unrepaired. Sand it lightly and apply an overcoat to prevent moisture getting in and affecting a larger area or rotting the timber beneath. Check the paint's eco credentials. Children, plants, pets and wildlife need to be safe, so check the labels and be sure you know what you are using. Know your product. Paints and varnishes sit on the surface of the wood and create a protective layer. When it’s time to reapply you need to sand them back before you recoat. Oils and wood stains penetrate the timber giving additional protection and offer greater resistance to damage or flaking. When you need to reapply you can just clean the surface and add an extra layer. One of the most beautiful finishes for external walls is limewash, which is made from lime and water, in a range of mostly pastel shades. It is ideal for porous surfaces such as brick, stone, lime plaster or roughcast and needs renewing about every five years. You will find it readily available at retailers such as Mike Wye, which also runs training courses in the use of natural paints. Get practical advice on how to lime wood in our guide. You can also make limewash with chalk paint. Find out how to make limewash with Annie Sloan's chalk paints. Masonry paint is ideal for refreshing greying render and is available in a broad, sophisticated palette. Opt for a texture if you need to disguise fine surface cracks. It is best not to paint brickwork, which if already painted can be carefully stripped to reveal the original surface underneath. The downside to masonry paint is that it is not breathable in the same way that limewash is, although paint companies have reduced the levels of VOCs contained in it, making it a more environmentally friendly option. There is a wide range of paint available for exterior woodwork, with most manufacturers producing a wood gloss or eggshell suitable for exterior use, which can be used for applications ranging from painting a timber conservatory to a summerhouse to outdoor furniture. Make sure you prepare the wood properly with an appropriate primer, to prevent the wood from absorbing the paint and to ensure an even finish. We have a step-by-step guide to painting furniture and a buyer's guide to the best furniture paints. Metal paint needs to be very robust, for protecting railings, gates, guttering and furniture. Exterior eggshells are often suitable, but sometimes the higher sheen level of a gloss adds a sense of grandeur. Metal usually requires priming before painting, but some brands, such as Hammerite can be applied directly on to metal. Repainting old metal furniture? Follow our advice on how to revive metal garden furniture. Historically, exterior joinery was usually painted, with front doors particularly singled out for special treatment. Porches, barge-boards, fascias and soffits were also often painted, with popular colours including dark reds, greens, browns, ochres, black, white, and cream. Brighter blues, greens and yellows were also used in the Victorian and Edwardian eras.